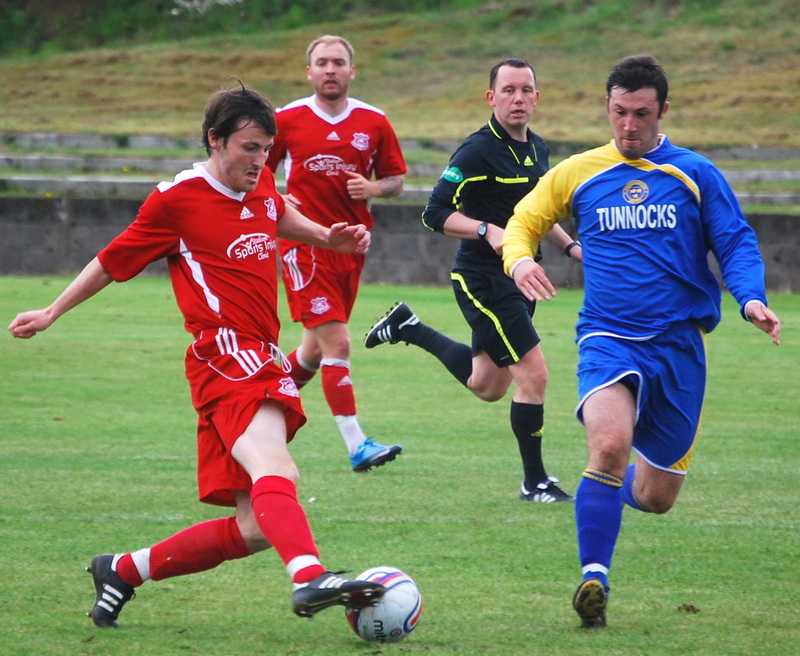 Glenafton played host to newly promoted Thorniewood United in the first ever league encounter between the two sides and those that resisted the allure of the Scotland international at Hampden, by terrace or by Sky, were treated to an incident packed match. With the Glens joint top goal scorer Lewis Sloan unavailable for selection his fellow top goal scorer Gareth Armstrong was partnered by trialist Ian Cashmore. However, it was the visitor’s current leading goalscorer Stevie Mullen that was first to catch the eye, and in jig time too. A long clearance into the ‘Wood half was quickly returned to the Glens’ territory and and a measured flick-on took three home defenders out allowing Mullen the time to execute the daintiest of lobs over the head of Ally Semple to open the scoring in two minutes. The finger-to-the-lips to silence the home support was superfluous as a pin could be heard dropping before the ball had left his golden foot, or Golden Stiletto as they call the annual goalscoring award at Robertson Park, an award which Mullen looks to retain . Silence continued to hang over the home terracing like a billowing Bannockburn banner over the Tartan Army as Thorniewood looked to build on their early success with waves of guerilla attacks deep into their hosts’ defences, right wide man Robert Allan proving a particularly sharp thorn in the side. On six minutes Richie McKillen and Kris Mitchell both won vital headers in the home box and Andy Bell never flinched and stood firm to block the loose ball from being battered home by Steven McGuire. Respite came a minute later when Bell tested Jon Connolly from distance the keeper relieved to see Neil Newman on hand to prevent Craig Potter drilling home the rebound. 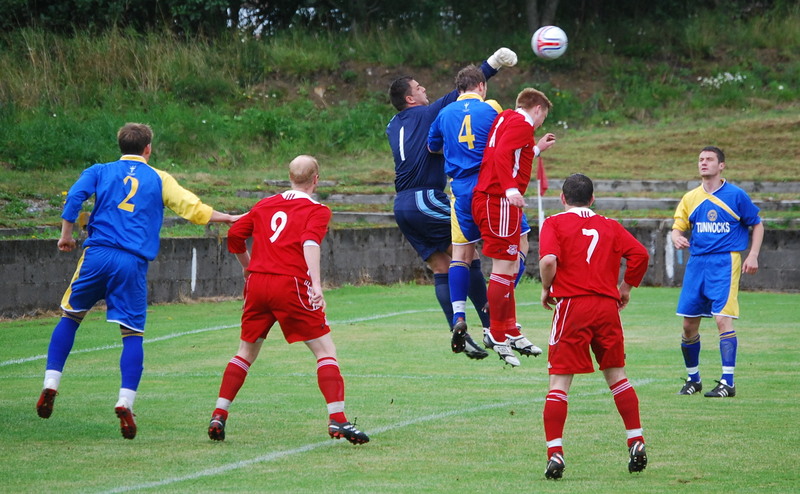 Minutes later the big keeper revealed the origin of his alias, ‘The Flying Fridge’, when he rose above friend and foe of Newman and Cashmore to punch the ball clear and set Allan off on another counter-attack. Thoughts that the Glens had weathered the storm were dashed on 15 minutes when an innocuous looking shoulder charge by Craig McEwan on Des Bradshaw a few yards outside the left hand side of the penalty box was deemed to be worthy of a free-kick. And what a worthy free kick it was as Robert Allan slammed it beyond the four man wall and into the top right hand corner of Semple’s goal. Shell-shocked Glens responded and five minutes later Connolly pulled off a stunning save from an equally stunning volley from Cashmore. The keeper’s two-handed save on the line from a Robbie Henderson header from the corner kick wasn’t too shabby either. The ‘fridge’ did lose his cool slightly minutes later when he fumbled the ball under pressure from Armstrong, but to his relief Ryan McAloon booted the ball to safety. Within a minute of the re-start Mullen capitalised on some hesitancy in the home defence allowing him a clear run in on goal but Semple proved his match. On 53 minutes a McKillen trip on Jack Bennet yielded another free-kick from a dangerous location but although Allan got the ball up and over the wall it drifted wide of the stranded Semple’s right hand post. Four minutes later Cashmore refused to give up the ghost when his burst into the box took him to the dead ball line from where he hooked the runaway ball across the face of the goal forcing Connolly to push it over the bar. The ‘Flying Fridge’ then got a fist to the corner before it could reach its target of Armstrong’s head. On the hour mark the busy Bradshaw nicked the ball at the edge of the box and forced Semple to dive full length to push to his angled drive inches wide of the post. Three minutes later a great spot from the stand side assistant referee spotted Armstrong being impeded in the box as he waited to accept the ball. After some ‘ball not on the spot’ gamesmanship Gareth Armstrong stepped up and coolly slammed the ball past Connolly. The home side’s tails were up and a Mitchell drive from 20 yards had Connolly on his knees at the post, a good vantage point from which to watch the ball roll just wide. McKenzie was now pulling the strings his runs down the right flank before cutting inside now a thorn in Wood’s side. On 80 minutes his pass to Cashmore on the flank was launched into the box for Armstrong who was clumsily bundled off the ball by Jamie Brophy in full view of the referee, the official left with little choice but to point the spot. This time Connolly kept his cool diving low to his left to turn the ball out for a corner. Four minutes later substitute Chris Faulds’ effort from a tight angle skimmed past Semple’s far post and soon after McGuire rounded the Glens’ goalie but McEwan was on hand to clear the danger. Glens: Semple; McEwan, Greenlees (Menzies), Henderson, McKillen; McKenzie, Mitchell, Potter, Bell; Cashmore (Wilson), Armstrong. 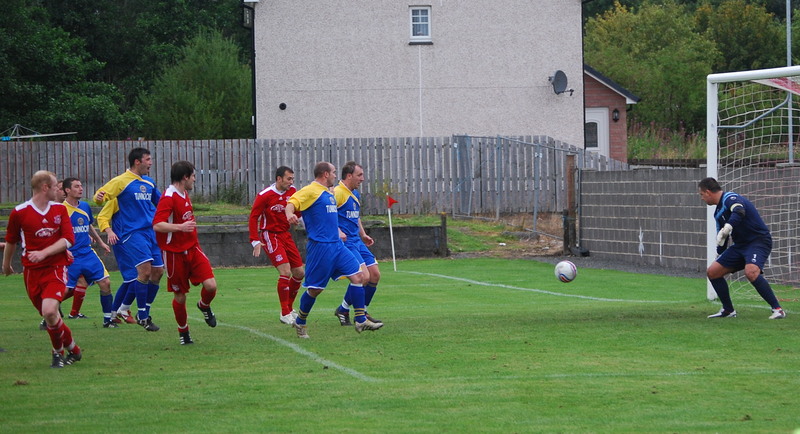 This entry was posted in GAFC Match Report and tagged Thorniewood United. Bookmark the permalink.